As many of my regular readers might have noticed, these last few posts have been a departure from my usual musings about education, technology, and all things related to those fields. As a new mom, all-things-baby have (understandably, I hope) taken over. I’m managing to be back to work full-time, but the priorities in my day are, well, rearranged. Especially given that I need to express breast milk at least every two to three hours I’m away from my son (usually three times per work day). So for now, being back at work also means pumping. Which, for this mama, has been beyond challenging. Yesterday marked 6 months of breastfeeding my son. Six months. I can’t quite believe it. Before I had my baby, I chose 6 months as a goal for breastfeeding, based on things I’d heard and read. After all, everyone says “breast is best.” But until you go through it, there’s no way to understand how breastfeeding will (or won’t) fit into your life. Anyone close to me (or anyone who has kept up with my pregnancy- and postpartum-related posts) knows that breastfeeding has been difficult for us from the start. My son had a lip- and tongue-tie, which made it feel like a vice grip was clamping down on my breast every time he latched on. I bled almost every time he breastfed at first. I spent many nights wide awake those first few weeks — not because my baby wouldn’t sleep, but because I was in too much pain from breastfeeding to get sleep in between his feedings. My anxiety was through the roof, and I found myself counting down the minutes until the next time we would attempt a latch. I sent late-night texts to my lactation consultant and posted questions in desperation to Facebook mommy boards. It was more painful than I ever could have imagined, and nothing like what I’d expected. I attended a nursing circle once a week, where new mommies would go around and share their latest trials with breastfeeding. Having that once-a-week contact for a while kept me sane. Many people suggested I give up. And I tried at least once to stop. But on top of knowing that breast milk is the healthiest thing you can give a newborn, we quickly realized that my son is sensitive to dairy and soy. Whenever I ate cheese, milk, or ice cream (the worst offender), his reflux would flare up, and other things would happen that I’ll spare you the details of here. Needless to say, going into a store and grabbing formula off of the shelf wasn’t going to work for us: most formulas are dairy based. Those that are dairy-free are soy based. So for my son, breast milk is literally the only thing he could consume. Since it was summer, and I’m a teacher, we had the luxury of time to figure this all out, together. So despite our struggles, we kept at it. Sometime over the summer, I began to suspect that I might not be responding to the pump as well as other mamas who pump. I would get anywhere from .25 to 2 ounces, total, in one pumping session. I pumped religiously at the same time every day, but it took a very long time to build up a freezer stash of milk in 1- or 2-ounce increments. When I returned to work, I quickly realized my suspicions were true: I was not responding to the pump well at all, and along with the stressors of returning to work before I was ready to, I now had to deal with not expressing enough milk for my son to eat the following day at daycare. I spent the first few weeks back at work stressing out about how this would all shake out. Clearly, my dwindling stash of frozen milk would not last very long. My pumping sessions at work have amounted to an average of 2 to 6 ounces, total, for the day. My son eats a minimum of 12 ounces per day. So I’m thawing 6-10 ounces of frozen milk per day to supplement. You do the math: it’s not sustainable! There are many amazing things about breast milk. Like the fact that it’s literally tailor-made to your baby. If you’re exposed to an illness, you immediately begin producing antibodies in your milk so that your baby gets some protection from that illness. Crazy, right? You also produce more milk, the more the baby nurses. The production part has been tricky for me — Monday through Thursday, my son nurses only in the morning, overnight, and at bed time. During the day, I have to pump. But since I’m not responding well to the pump, by Thursday my supply has dropped dramatically (since I’m not able to express as much as I am when I’m nursing full-time, my body doesn’t think it needs to produce as much). Friday through Sunday, my son nurses every hour or two, and by Sunday night my supply goes back up. It’s an unfortunate cycle that will continue until he/I/we decide it’s time for him to wean. In the meantime, I’ve tried all sorts of things to help boost my supply. I’ve eaten scads of oatmeal and quinoa — two grains that allegedly help your milk supply. I’ve made lactation cookies (which are full of oatmeal, flax, coconut oil and other goodies to help boost caloric intake and milk production). I’ve resisted the urge to diet (despite being two sizes bigger than pre baby) since breastfeeding mamas need more calories to make more milk. I’ve pumped on one breast while nursing my son on the other (which, if you haven’t tried or witnessed it, is as acrobatically challenging as it sounds). I’ve tried hand-expressing, reverse pressure softening, and the massage-stroke-shake method. I’ve taken fenugreek, blessed thistle, and other supplements. I’ve consumed gallons of water. I’ve sniffed my baby’s worn clothes, watched videos of him, and looked at photos to encourage my milk to let down while attached to the pump. I’ve listened to meditations and visualized milk flowing into the bottles. 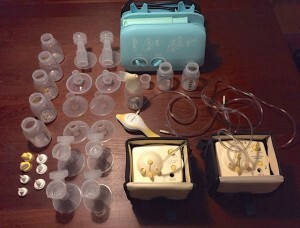 I’ve tried all kinds of different pumps and parts (see photo above for a visual, which is only a sample of what I’ve bought or rented). Speaking of pumps, I have two Medela Pump In Style pumps (one that my health insurance covered the cost of, and one that my mother purchased for me so that I wouldn’t have to lug one back and forth to work every day); I have a manual pump, which I’ve found to be most helpful when pumping-while-nursing; and I recently rented a hospital-grade Ameda Elite, in a last-ditch effort to try and produce more milk. Sadly, none of the different pump parts, sizes, styles, or brands helped me produce any more milk. I am one of the unlucky few who just doesn’t respond well to the pump, period. But for now, let’s focus on the positive: WE MADE IT TO SIX MONTHS!!!! It feels like a huge feat. Because it really, really, is. As I conclude this post, I just want to acknowledge a few things: first of all, I realize that not all mamas can breastfeed. Sometimes the milk ducts just don’t work. Sometimes previous surgeries, illnesses, or other treatments prevent nursing. Sometimes physical disabilities or injuries make it simply impossible. And while I feel like someone should pay me a million bucks for how hard these last six months have been, I respect and understand that breastfeeding doesn’t work for everyone. And there’s no judgment in that. We went this route for a variety of health and philosophical reasons — but it was also an option that was available. If I had to go back to work at 6 weeks, there’s no way I would have been able to keep at it. Which leads me to another point: clearly, working women were not built to return to work so soon. Both the World Health Organization (WHO) and the American Pediatric Association (APA) recommend exclusively breastfeeding babies for at least six months. After that, the APA suggests continuing breastfeeding for at least a full year; the WHO suggests the same for up to two years and beyond. Wouldn’t you think our policies for working moms would work around these research-based recommendations? I mean, if we’re so concerned about autoimmune disorders and other diseases that might be linked to our diets — health issues that cost individuals (and the healthcare industry) billions of dollars every year to treat — shouldn’t our daily practices help support the WHO and APA’s recommendations for health when a human’s life begins?